Before February 2012, when his name exploded onto the front pages of newspapers around the globe, most people outside of China had never heard of Bo Xilai, the now-fallen Communist Party Secretary of the megacity of Chongqing. But in the years leading up to the murder trial that brought him (and his wife, Gu Kailai) to the world’s attention, Bo, a veteran of Chinese high politics, had already become a figure of national notoriety for an anti-corruption campaign, which he adorned with a flamboyant city-wide revival of revolutionary songs. China Concerto, which director Bo Wang (a Chongqing native) calls “a film about spectacles,” was shot in 2010 and 2011 during the peak of Bo Xilai’s so-called “Red Campaign.” The film takes the viewer into Chongqing’s streets to witness a selection of public spectacles, seemingly unrelated to the political climate of the red campaign, and manages, with only the slightest allusion to the politician leading the city, to take the rising temperature of the city that would soon be consumed by scandal. My name is Bo Wang, I am the director of the film China Concerto. 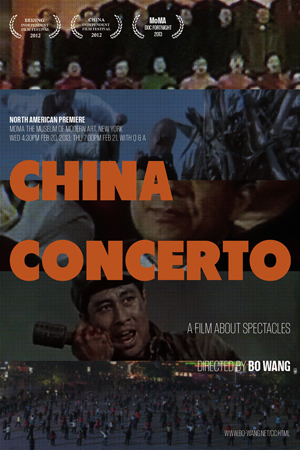 China Concerto is an essay film about spectacles and performances in today’s China. The movie was shot in 2010 and 2011 mostly in Chongqing, which is one of the biggest cities in China. And by that time it happened to be the peak time of Bo Xilai’s “red campaign.” As you know, Bo Xilai is the Party Secretary of Chongqing who had this huge scandal last February when his police director ran into the American Consulate asking for asylum. The term “spectacle” is borrowed from the French philosopher Guy Debord and his book The Society of the Spectacle. Basically, Guy Debord describes spectacles as the social relationship between people and images and how, in his terms, modern life has been alienated from reality—it’s been mediated by all the consumption of images. So, I’m very fascinated by the same situation in China right now. It’s like you can see lots of political propaganda everywhere, and also see the ways of consumption everywhere. China now is [a] mixture of different types of consumption of images, either it’s political or it’s commercial—it’s just mixed together. So, in Chongqing and in many cities in China there is a huge tradition of public dancing in the evening, in lots of public squares or parks. It’s always very fascinating to see how hundreds of people can synchronize with one another without any leader to this kind of corny, cheesy music. I spent lots of time filming this kind of public dancing. I found this kind of model behavior is a good model to understand how social regulation in China works. In a way, let’s take public dancing as an example: I think it would be too naive to believe that everyone who joins the public performances appreciates the lyrics of these songs. If you interview people, if you ask them, many of them will say, “Oh, this song is too bad, it’s too cheesy,” but, for whatever reason they just joined the performances in a connective way. I think that’s also how propaganda and social regulation works in China right now. It’s just that they are not manifested through making people believe, but through the way, how they can shape people’s behavior. You don’t have to believe. I think it started from the year 2007 or 2008. There was an annual celebration on Christmas Eve. Hundreds of people would gather in this district and punch each other with inflated hammers or bats, which was crazy and fascinating. During this time in 2010, when Bo Xilai’s political campaign was in its peak time, from my understanding, the police department had become so powerful and had, in a way, the strong desire, to control everything. So, of course, this kind of crazy ceremony has become part of their subject. It’s kind of weird. I don’t think there’s any real reason to bring up so many policemen in this situation, but that’s what they did. During the Cultural Revolution time, Chongqing had the most fierce physical struggles in China—people literally used tanks and warships to fight each other. Officially, more than 1,000 people were killed. So, most of them were buried in a small corner of Shapingba Park. So, I decided to make a trip to this park to see what the cemetery looks like. What’s really fascinating is that there’s a huge contrast in this park. You can see fake Statue of Liberty and fake Mount Rushmore and people doing all kind of entertaining stuff in this environment. And at the same time in this same park, in a hidden corner, you see this cemetery for Red Guards, where you see a sign for “No Videotaping” outside the cemetery. The whole yard is locked. I find it so fascinating that it can be a good metaphor or example of showing how the country’s history is constructed, where certain things were brought in and certain things were intentionally ignored.